I absolutely love cooking with children! Not only is it a great bonding activity, but it also promotes literacy at the same time. I’m a firm believer in preparing healthy foods with kids, so when I set out to review cookbooks for kids, this remained at the top of my critique list. 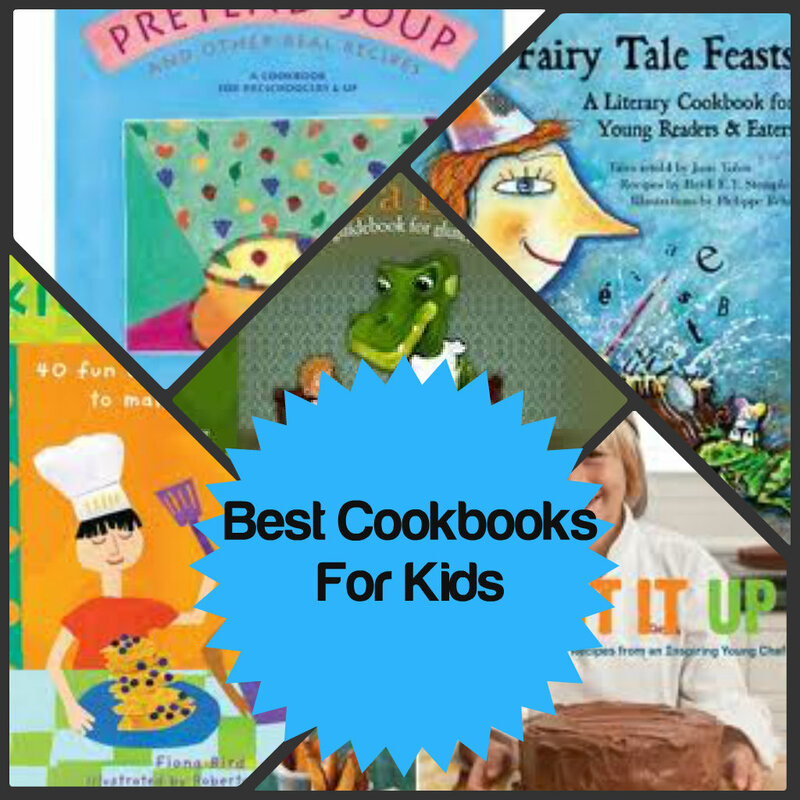 Here are my children’s cookbook recommendations. I’ve listed them by age appropriateness. We’ll start with the little ones and work our way up to our growing chefs. 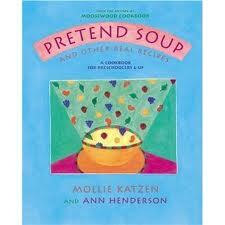 Pretend Soup and Salad People were written by Mollie Katzen for the preschool crowd. The recipes appear twice. First they are written for the adult along with suggestions and then there is a simple sequenced pictorial spread for the child. Pretend Soup which has sold over 200,000 copies has the recipes for Green Spaghetti, Carrot Pennies, Blueberry Pancakes and many more. Salad People is the follow-up book and is a bit more adventurous. Here you will find recipes for Focaccia, Mango-Honey Lassi and Cool Cucumber Soup. I’m so impressed with the quality of recipes and the simplicity of the directions for 3, 4 and 5 year-olds. Katzen also has another book for the 8 and up crowd called Honest Pretzels. 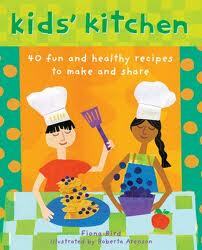 Kids’ Kitchen by Fiona Bird and Roberta Arenson includes 40 fun and healthy recipe cards. The deck of cards is divided into five color coded sections: Eggs ‘n’ Beans, Fantastic Fruits, Milk ‘n’ Dairy, Spuds ‘n’ Grain and Vital Vegetables. All of the recipes are vegetarian and include meal ideas to go with each recipe. There are also multi-cultural recipes. I’m so impressed with the nutritional education that comes with each recipe. The Breakfast Friends recipe states that, ” it’s loaded with protein and carbohydrates that help to power you up for an energetic day.” Not only will kids learn how to cook nutritional dishes, but they are becoming empowered with healthy eating tips and practices. I also like that the recipes are printed on heavy-duty cards which works well with kids in the kitchen. Your child will learn how to make: Apple Volcanoes, Tropical Milkshakes, Mellow Yellow Rice and Picnic Kebabs as well as 37 other dishes. This just might end up on my 2012 Literacy Gift Giving Guide! 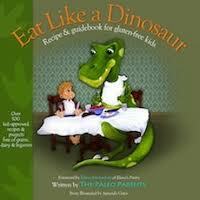 Eat Like a Dinosaur: Recipe and Guidebook for Gluten-Free Kids by The Paleo Parents grabs you with the fun cover! The book is filled with over 100 recipes and easily coded for kids who suffer from a food allergy. How about some Cinnamon Apple Creamed Hot Cereal, Deviled Bacony Eggs or Hissin’ Chicken? Twist It Up was written by a student named Jack Witherspoon. Jack suffers from leukemia and has had many hospital stays. While in the hospital, he watched a lot of the Food Network channel. During his recovery, he began to cook and really liked it. He now does fundraisers to help raise funds for the Miller Children’s Hospital through his cooking endeavors. I really like that the recipes are healthy and fun. Your child can learn how to prepare Norwegian Pancakes, Super Spinach & Cheese Enchiladas and Old-Fashioned Apple Pie. 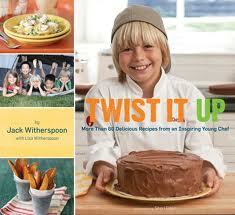 Each recipe has a suggestion for “twisting it up”. Great photographs accompany each recipe. I’d say this book is geared for the 8 and up crowd. 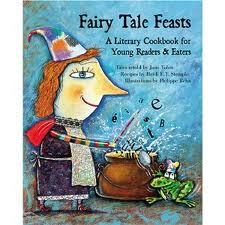 Fairy Tale Feasts: A Literary Cookbook for Young Readers & Eaters by Jane Yolen, Heidi E.Y. Stemple, and Philippe Beha is filled with tales, recipes and food history. Each tale is accompanied by a recipe and some food facts. After reading, The Fox and the Grapes, you can make a fruit salad and discover that grapes are berries and average 100 to a bunch. The recipes are healthy and simple. I would recommend this one for ages 10 and up. So there you have some of the best healthy cookbooks out there. What will you be cooking with your kids? Looking for more fun cooking with books ideas? Visit my Yummy Stories for Kids Pinterest Board! Follow Jodie Rodriguez @ Growing Book by Book’s board Yummy Stories for Kids on Pinterest. Thank you so much for leaving a comment. It’s so nice to hear from an author of a book we showcase. I’ve checked out the One Planet Picnic site and it does look like there are lots a great resources and it’s a wonderful idea. Thanks for sharing. Visiting from WeTeach. Love your whole blog! We are big fans of Pretend Soup. I love that my pre-reading children can really follow the recipe on their own, with just a little help from me. I am going to check out Fairy Tale Feasts. Looks like a fun way to tie reading to something my daughter loves to do– cook!